*Students taking 3-5 credits online are eligible for $250. Students taking 6+ credits online are eligible for $500. 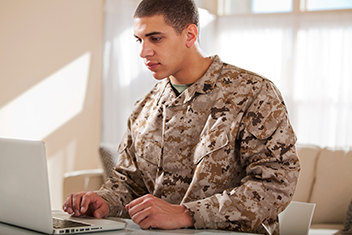 Active duty military, Veteran, Reserves, National Guard, and Gold Star Spouses in degree-seeking undergraduate or graduate online students in LAS or Engineering taking three or more credits in an online course offered via ELO in a term. View the complete list of qualifying courses. Candidates must have completed one semester prior to the term in which they are applying for. This scholarship has been established by Engineering-LAS Online Learning at Iowa State University. This scholarship is to show our appreciation for those who have and are currently serving our country and have also made furthering their education a priority. Recipient shall be a degree-seeking student taking at least 3 credits of an ELO online undergraduate or graduate course. Priority will be given to applicants in the Colleges of Liberal Arts and Sciences or Engineering, but students from all colleges are welcome to apply. View the complete list of qualifying courses. Academic achievement will be a consideration. A cumulative GPA of 2.75 will be required for selection. If no graduate GPA is available, use undergraduate GPA. A one-page essay by the applicant describing why you believe you are deserving of the scholarship and why you are obtaining your degree online. Please also briefly describe your military service. Essays are uploaded in the online application. Format must be .doc or .pdf. Up to $500 (2 per semester). Students taking 3-5 credits online are eligible for $250. Students taking 6+ credits online are eligible for $500. The completed application and essay must be submitted electronically no later than 5:00 pm the day of the deadline. Note: Decisions are made approximately within two weeks of the application deadline. Recipients will be notified by email once a decision has been made.